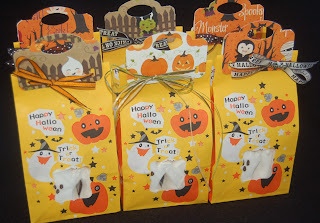 I needed two girlfriend treat bags and as usual I had to make them 'yesterday'. Anyway, here is my quick solution. I started with leopard (or is it cheetah?) 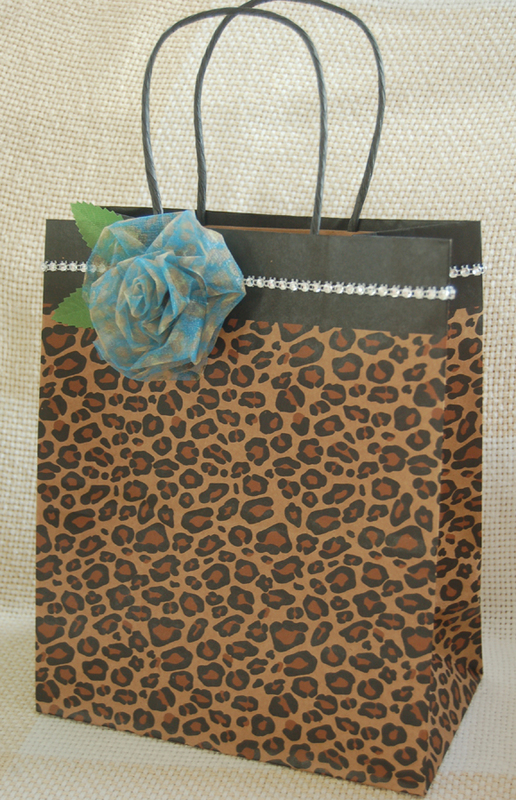 print paper gift bags. Next I used Fabri-Tac glue to adhere some bling-bling to the top border. (The bling came on a roll discovered in the wrapping department of Ben Franklin Crafts. They look like rhinestones but are actually some lightweight plastic faux crystals. 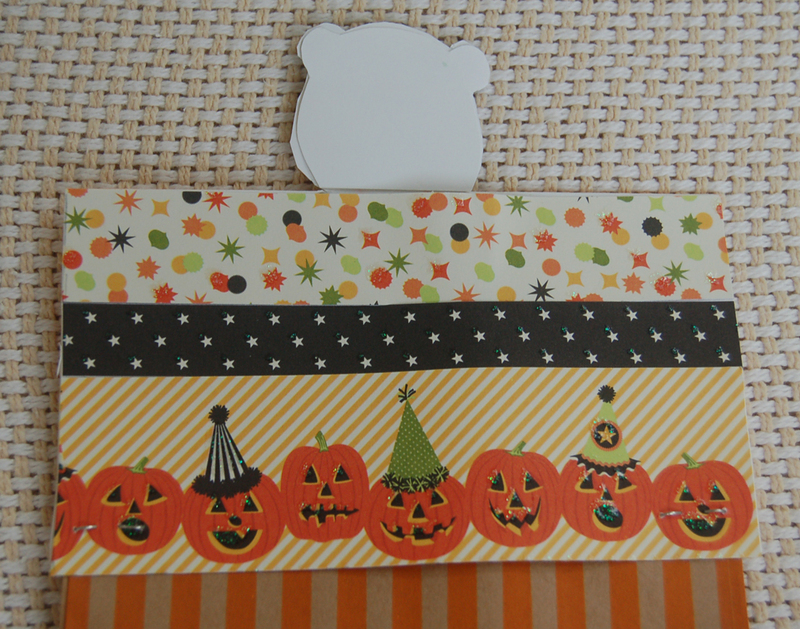 There are ten yards on the roll so imagine how many cards you can decorate.) For the fabric flower I cut a 24" piece of organza ribbon (from the BFC floral department) and then cut it lengthwise in half. (You'll be able to make two flowers with this amount.) There are many colors and prints of ribbon so you don't need to select the one I did. 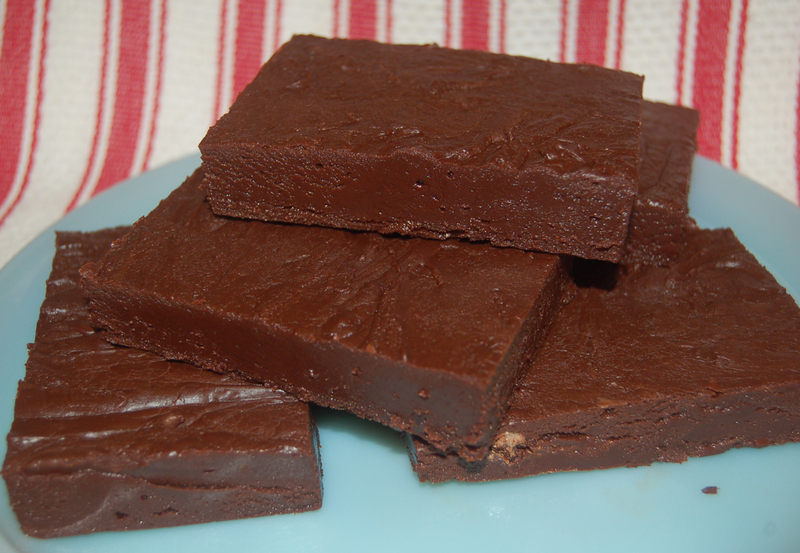 Take the halved ribbon and fold it in half lengthwise. Start making the center of the flower by rolling and gluing. Keep gluing and gathering the folded ribbon until the rose is completed. Glue the flower and leaves (Wilton decoration) to the bag and it's done. 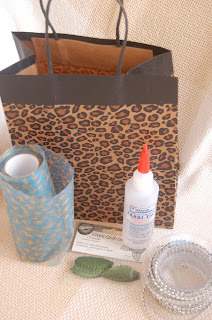 Even if you need dozens of gift bags you can do them in a snap using these techniques and supplies. 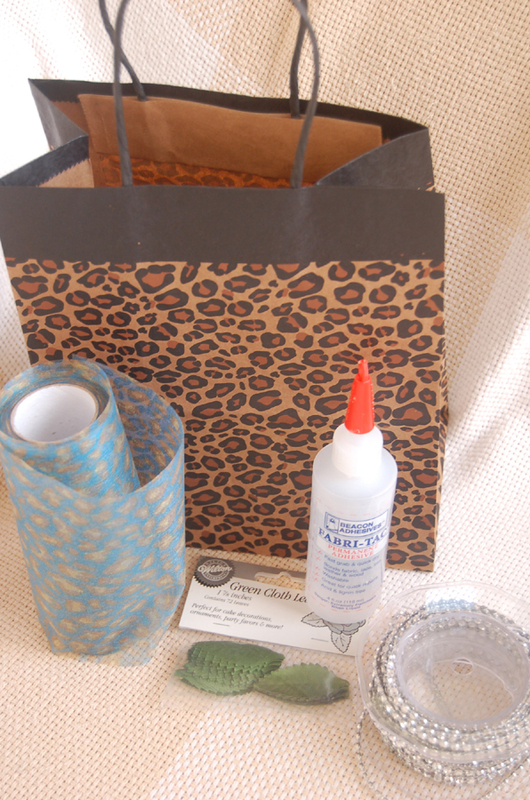 With all the upcoming holiday parties, don't stress out; keep your gift wrapping simple. Enjoy the simple life! 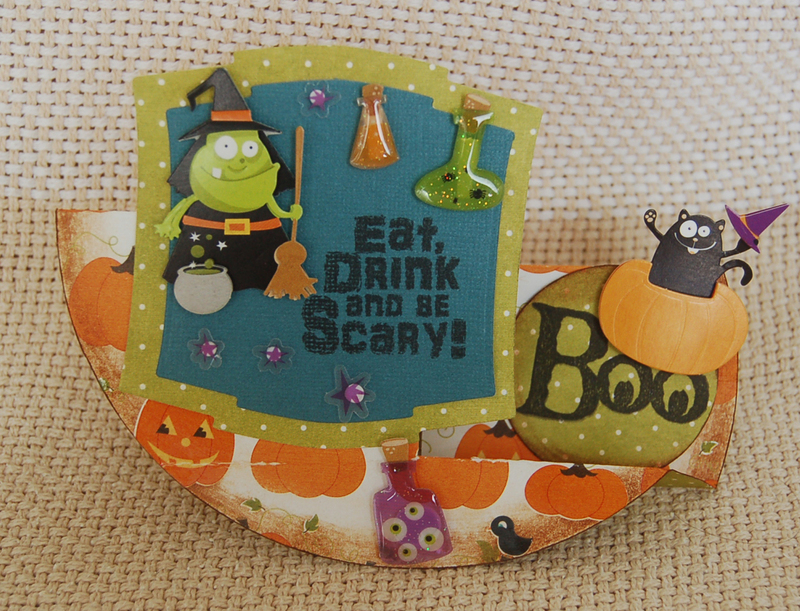 I just had to make one last card before putting away my Halloween supplies for this year. This card was made for my 'scientist' son. The six stamps used on this card (there were more in the set) came from Viva Las Vegas Stamps in the form of an unmounted rubber sheet (very economical). Before beginning the card, I mounted the stamps on a EZ Mount backing (available at Ben Franklin Crafts) and cut them out separately. I used a Sierra Pacific kraft paper card for the base (also from BFC). Simple stamping with the use of paper masks (to prevent ink from getting on some areas) and a piece of acetate to give the illusion of glass was all it took to make this scientifically scary card. 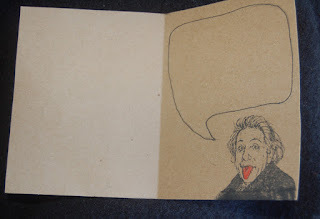 The Einstein caricature on the inside of the card has a hand-drawn bubble that will be used to write a personal message. I hope my son will get a chuckle from this Halloween card made just for him. 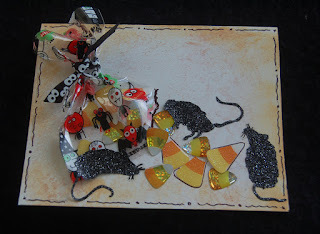 Happy Halloween to everyone in blogland! 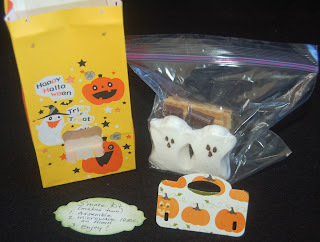 After reading a post with a s'more kit photo on Little Paper Studio (www.littlepaperstudio.blogspot.com), I remembered that last year I wanted to make s'more kits but never got around to getting the supplies. I'm proud to say that I got them together this year. 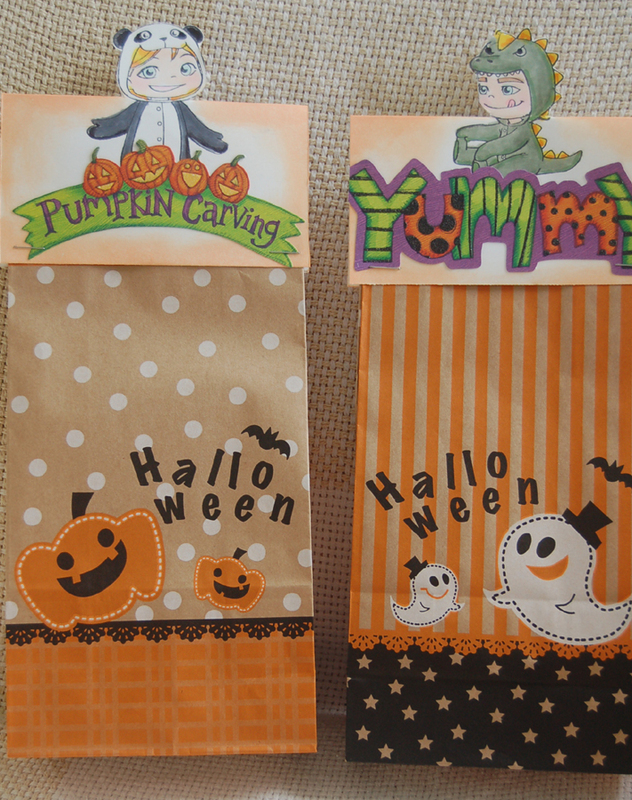 I started with the colorfully printed paper bags I purchased from the Celebrations store in Mapunapuna (near the BFC store). 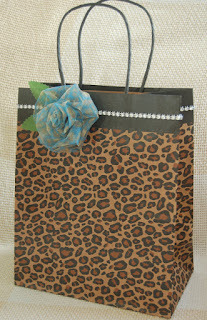 I used the Martha Stewart (anywhere punch) to make an opening in the front of the bag (the punch fit perfectly). Next I cut the toppers using Imaginisce double sided Halloween cardstock (good way to use up scraps) and the Sizzix Treat Bag Topper die. Labels for the instructions were cut using the same die. Two ghost marshmallows, four graham crackers and two pieces of a chocolate bar were packaged in a Ziploc bag. These ingredients were placed in the bag and the topper fastened with ribbon strung through holes punched in the bag. Because the back of the toppers were sometimes upside-down due to the one way design of the paper, I placed the instruction label over it. This fun kit is easy to assemble (no cooking required) and makes a yummy Halloween gift/treat. I hope you're enjoying my Halloween ideas and you'll return to see a few more before the 31st. Thanks for visiting! Our family has an eeeky squeaky LOL Halloween story that not all of us think is funny. Years ago when our oldest son lived in a very posh condo, he kept complaining about a possible ghost in the unit because things kept moving around mysteriously. In the end, because most of the movement involved food, he set a trap and he caught a mouse. (I think it was a RAT, but mouse sounds cuter.) We still laugh about the incident (except our son who still is insists that it was a mouse), so I decided to kid him a little more I would make a Halloween card for him. I started with the Dandelion Design Halloween mouse set because the character is so cute and happy running around with the candy. 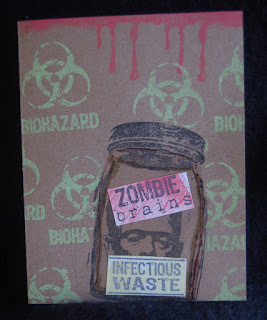 I stamped the images and words on the inside of the card (made from Marker pen paper available at Ben Franklin Crafts) and colored it with Copic pens (also from BFC). 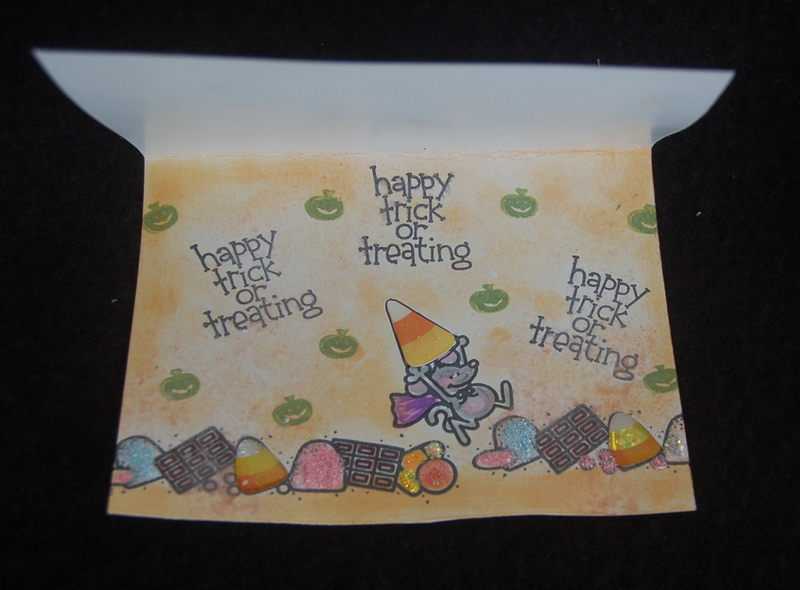 I added some candy corn stickers and Stickles. After the Stickles gel was dry, I smudged on some Ranger Distress Ink (marigold) and copper Tsukineko spray. For the front of the card I cut out a small section of a cellophane treat bag I purchased from the Celebrations store, tied it with a ribbon, and glued it down. 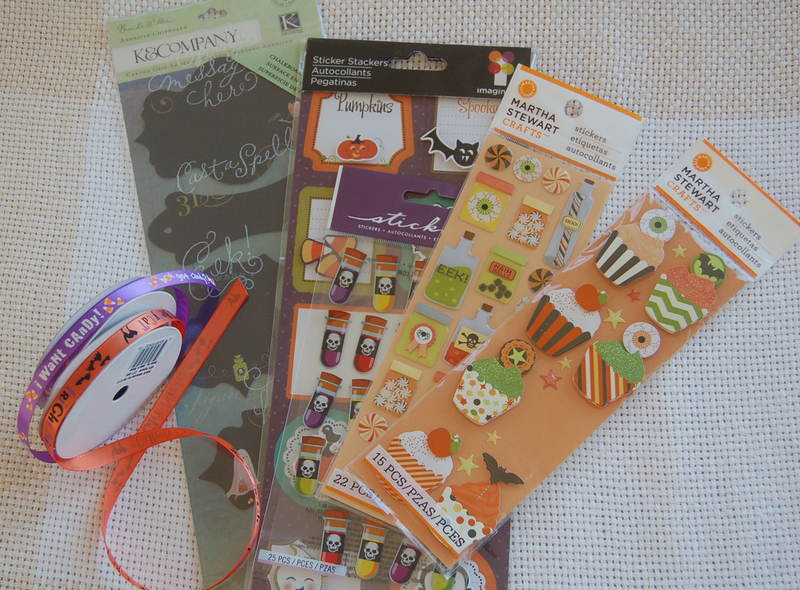 I adhered some candy corn (some under the bag) and rat (Martha Stewart) stickers from BFC. Then I smudged the background like I did on the inside of the card. Finally, I finished the card front with a hand-drawn squiggly line border. Do you think my son will find it humorous? Maybe not....LOL! I recently discovered the Fumi and Yumi rubber stamp line. These wide-eyed, cherub faced images are adorable and made perfect bag toppers. (I ordered the stamps online from Yumi and Fumi Handmade - http://yumifumihandmade.com/) and the service was excellent.) 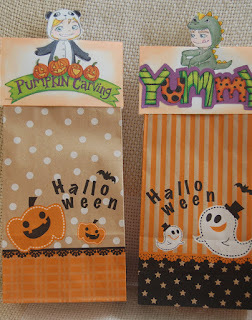 I began with the Halloween decorated paper bags (back and front designs differ) I purchased from the Celebrations store (near the Mapunapuna Ben Franklin Crafts). I determined the size of paper (marker pen paper from BFC) I needed (in this case 2-3/4" x 5") and marked the halfway point. Next I stamped the images so that the heads were in the upper half of the toppers. I colored the stamped images with Copic pens and used a craft knife plus scissors to cut out just the heads of the images. After folding the topper so the head popped up, I used Martha Stewart Halloween adhesive borders in the back to cover the cut out (dust the exposed sticky surface of borders with cornstarch so that the toppers will not stick to themselves). To cover the back of the image heads (because the ink bled through) I cut and glued on scraps of white paper. 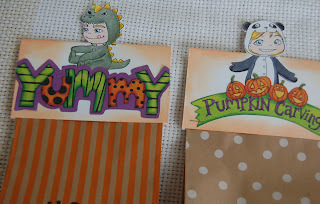 I glued on the word banners ( K and Co.) which I found in my stash of Halloween stuff, but I'm sure that you can locate lots of suitable printed words or rubber stamps at BFC. 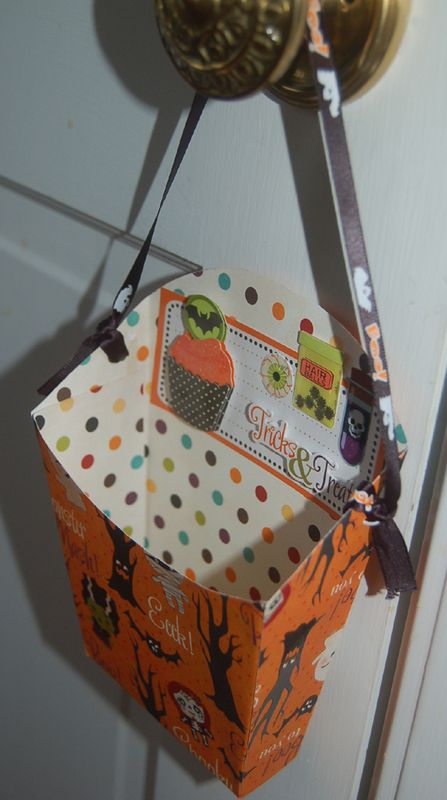 The final step for these easy Halloween treat bag toppers is of course to fill them and staple them shut. 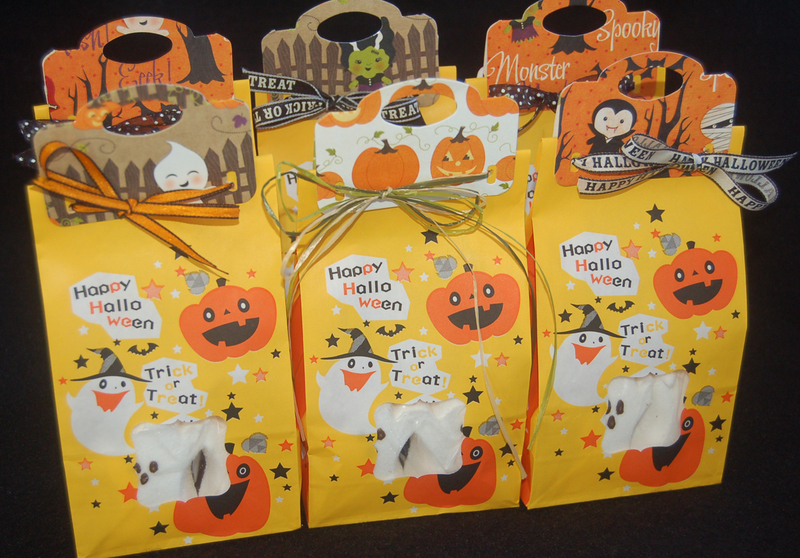 Have a cute and safe Halloween in blogland! What? Halloween Baskets? Why not? I think these ribbon-handled card stock baskets can be hung over a door knob as pre-Halloween treats. I used the Big Shot Pro French fry box die and 12x12 double sided Halloween printed card stock from Imaginisce. 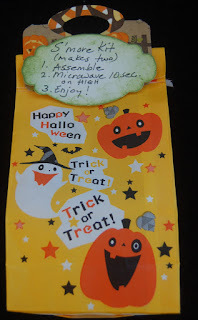 It was simple work to decorate the assembled boxes with Martha Stewart, Imaginisce, K and Co., and Sticko stickers and tie on the Halloween ribbons. All the products were purchased from Ben Franklin Crafts. Please note that the holes punched for the ribbons were positioned slightly towards the back of the box for balance. At first I thought that the K and Co. blackboard stickers had words on them but they were blank and so I could write my own message...how cool is that? I used a white oolored pencil and found that it could be erased so I got the lettering exactly how I wanted it. Check out the boxes on the Eclipse machine if you don't have the Big Shot Pro for this project. I wish I still had little ones at home because I would love to hang these baskets on their bedroom doors a few days before the 31st just to get the excitement started. If you don't want to give them a sugar high, think of putting gift cards, little toys, erasers, pens, or craft supplies in their Halloween baskets. I'm sure that Ben Franklin Crafts will have more than enough goodies to thrill your precious ones. I hope you'll try making these super easy baskets and make someone do a happy Halloween dance! 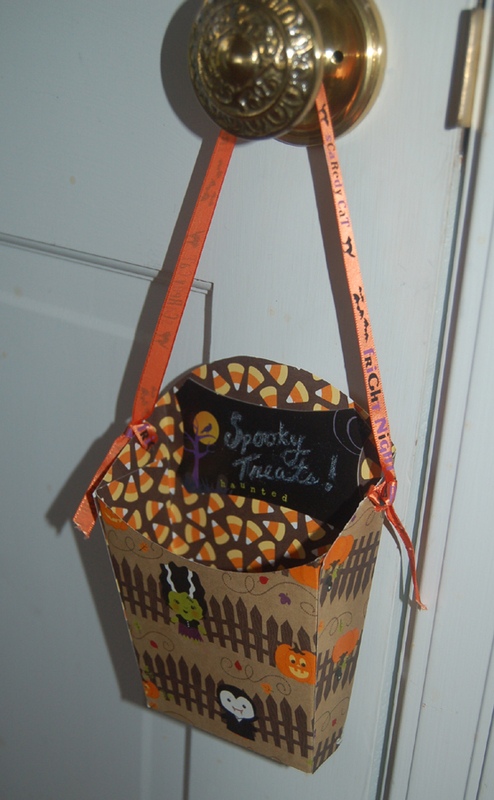 These treat boxes were made using the pizza box Big Pro Sizzix die and a black core scoreboard. If you cut the scoreboard just right, you can cut two pizza boxes (minus the labels and inside partitions) from one 12x12 piece. 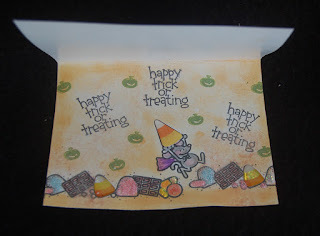 For the first one I wanted to achieve a spooky Godiva candy box look. I sprayed the box with gold Glimmer Mist (from the set) and let it dry. 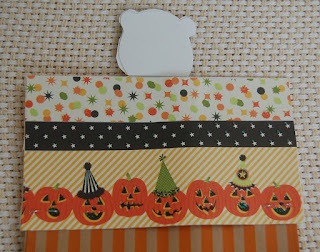 Next I used double stick tape on just the ends of a 1-1/2" orange ribbon and adhered it around the box. (This allows the ribbon band to slide on and off the box.) Double stick Merikan tape was used under the whole length of the thin purple ribbon (from Ben Franklin Crafts). The final easy step is to glue the dotted and paw print black ribbons to the cat rossette (Martha Stewart) and glue all of it to the ribbon band. Because of the Dandelion Design cat image, the second pizza box has a sweeter look even thought it uses the same black box as the other one. Imaginisce Halloweeen double sided card stock with glazed images were used for the background and frame ( green reverse side). The frames were cut using Sizzix dies (from a scallop set) and the image was colored with Copic pens. These pizza boxes would be great filled with candies, note pads and mini pens, or craft supplies but I think a thick slab of fudge sounds wickedly wonderful. LOL! Thanks for stopping by. I hope you'll visit again to see more of my Halloween projects. 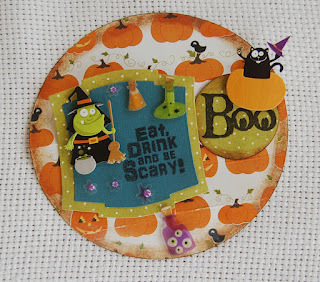 I love this circle card because it is incredibly easy but looks like it took a lot of effort. The base of the card is what makes it special. (I found the template in a Magnolia magazine.) With the Martha Stewart scoreboard and circle cutter it's a snap to make the base from printed cardstock (Imaginisce). 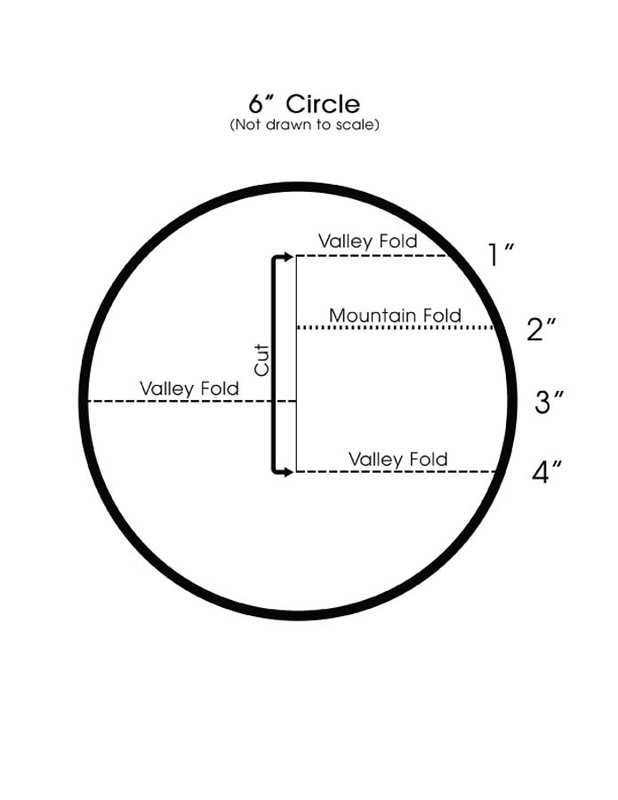 First, cut out a 6" circle and then score the fold lines making sure you align the printed design the way you want it. Cut the slit and do the folds to form the card. Next I cut out the two squarish pieces using the Spellbinders Nestabilities (labels two) and a circle using a 2" punch. I used Hero Arts stamps for the words and decorated with Recollections stickers. 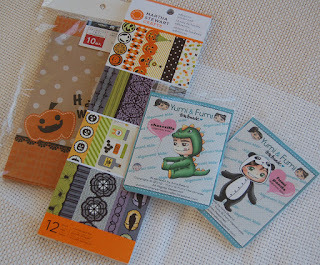 There are so many wonderful Halloween items at Ben Franklin Crafts; you gotta go check them out. 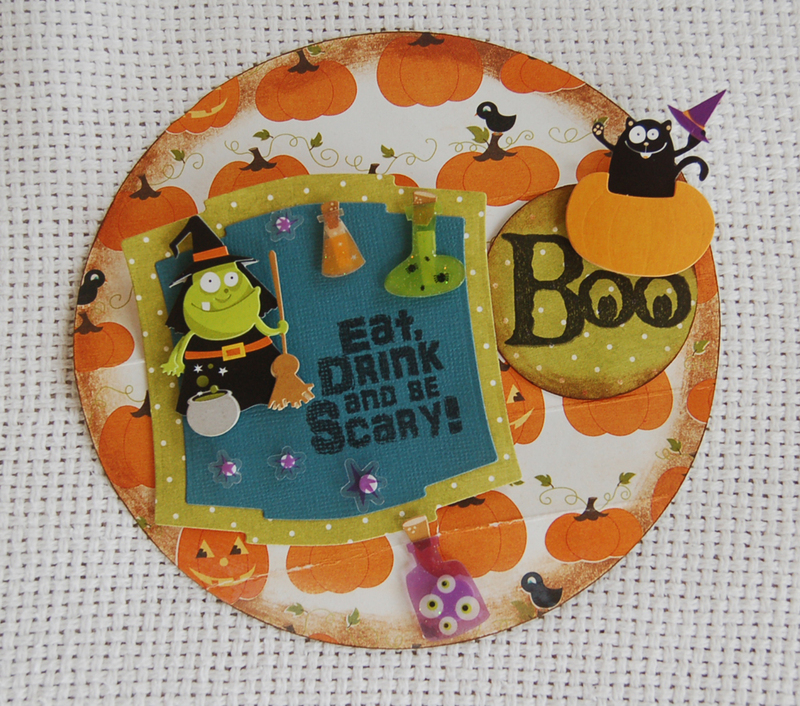 Have fun creating your own circle pop-up Halloween card! Whisk together yolks, juice, zest and sugar in a small saucepan. Cook over medium heat (5-7min.) stirring until mixture coats the spoon. Add the butter pieces slowly until they are all combined. Pour curd into a clean jar and refrigerate. 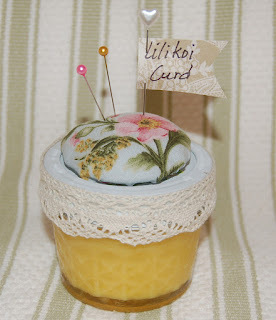 I've had this pincushion button jelly jar idea in my head for a long time and so I decided that it was time to finally just DO IT! I think the fact that I had just made a batch of lilikoi curd (a buttery lilikoi flavored custard spread for scones or toast) nudged my brain to creatively look at the canning jars again. Anyway, I started with a 4 oz. jelly jar (the kind with a two-part screw-on ring cover). I used the inner circle of the ring as a pattern for the cardboard base and I cut the base about 1/8" smaller all around. Next I hot glued a hand -ful of polyester batting inside the cardboard circle. 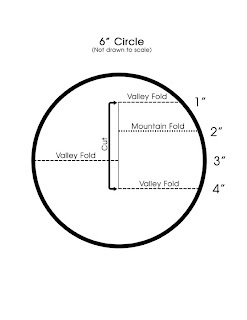 I traced and cut out a circle in floral print fabric about 1/2" larger all around than the cardboard circle. I hot glued the edges of the fabric circle that was stretched over the batting. To cover the messy fabric edges I cut another smaller cardboard circle and glued it to the bottom ( see photo). 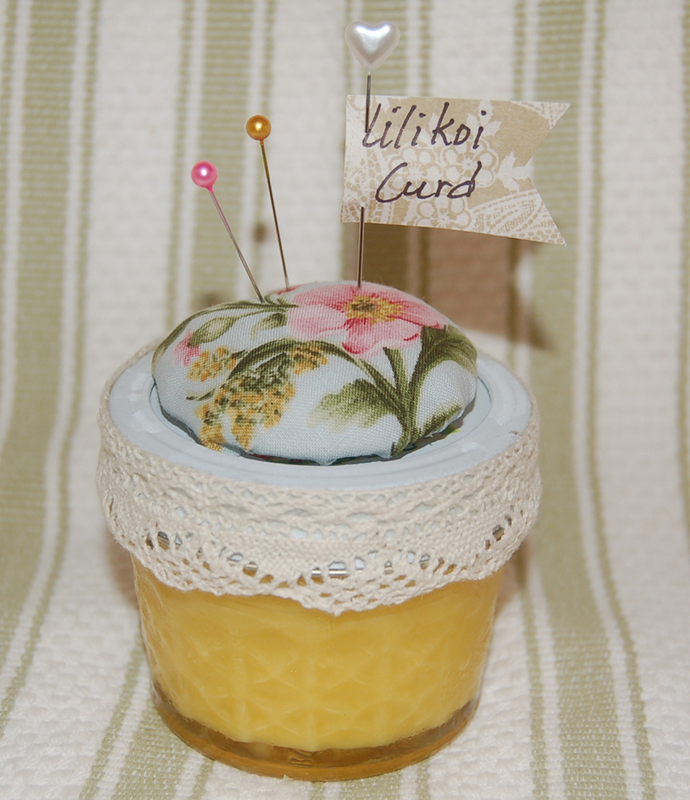 After finishing the pincushion, I had the great idea to combine it with my jars of lilikoi curd. 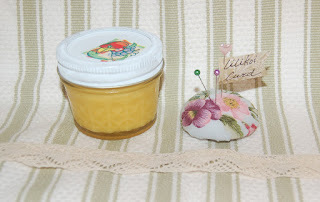 Not wanting the recipients to get the pincushion dirty while eating the curd, I just taped the padded lid and lace trim to the jar with double stick tape. 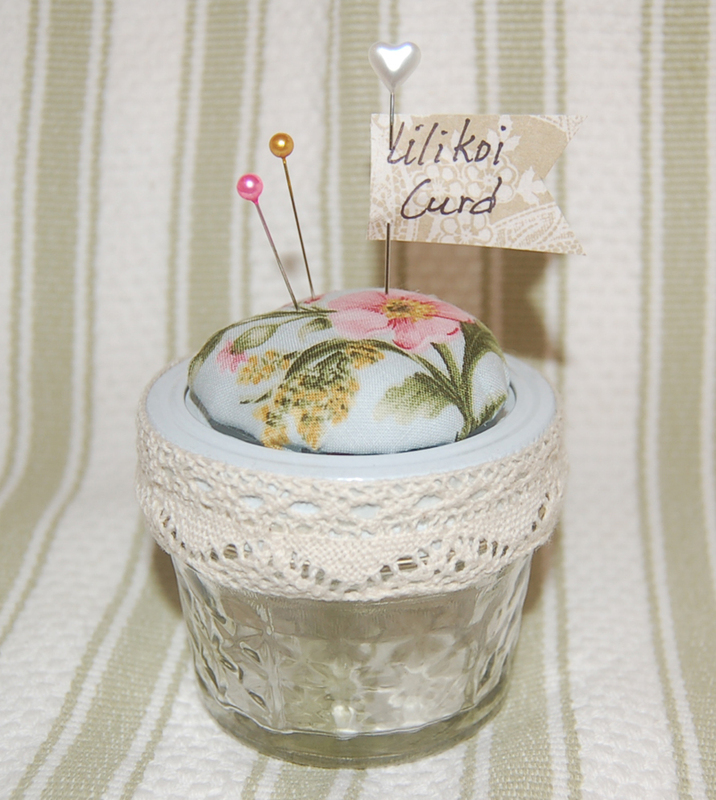 This way they can take off the decoration, eat the curd, wash the jar, and re-tape or glue the pincushion and lace. 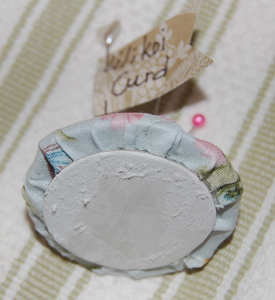 I am pleased with the way this project turned out because it is just how I imagined it and became a decorative way to present a gift of homemade curd. With the holiday season rolling up fast, you might want to try making pincushion jars and filling them with crafting embellishments or candy if you don't care to make jelly or curd. Thanks for stopping by.....hope you enjoyed your visit! Oh bad me, I promised myself that I wouldn't buy more paper without using more of what I already have, but I just couldn't resist the new papers I found at Ben Franklin Crafts. In the first photo are the delightful new ones from My Little Shoebox. Don't you just love the Asian themed one and the forest animal one..... perfect for the fall season? On the left side of the photo are just two of the matching double-sided die cut sheets that can be fashioned into flowers by spiraling the flower-shaped pieces. In the front of the photo are some of the stickers for this new line of MLS papers. 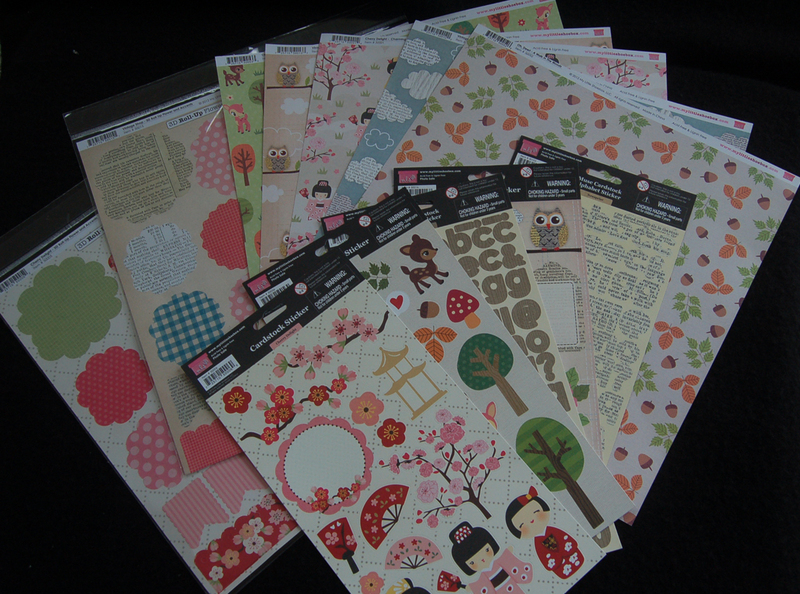 I just love the printed letter stickers! The next set of irresistible papers are kraft paper style by Graphic 45 (one of my favorite paper companies....I'm hoping the BFC buyers will pick up more papers from this line) and Canvas Corp. I think all of these neutral sheets will work really well with the burlap ribbon, crochet lace trim, and the Tim Holtz products sold at BFC. 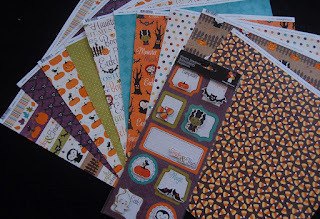 I plan to use the dotted and striped papers with my Halloween stuff for a vintage look. 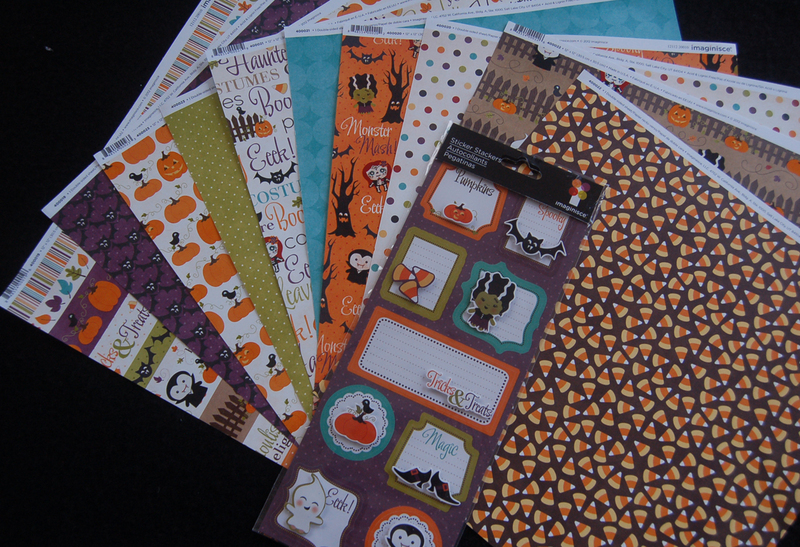 The last photo shows the new Halloween 12x12 sheets and stickers from Imaginisce, that I really did try to resist but they were just too cute. They are double-sided cardstock with shine on the designs (showing in the photo are the reverse side next to the front shiny side). 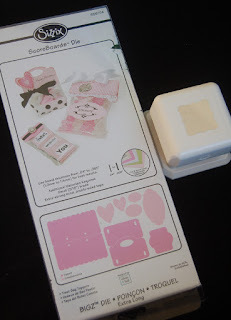 I just love using this type of cardstock in dies to make treat containers because the weight is just right for cutting/scoring and it's fun to see a pop of color inside the box/bag. Well, that's it for now....gotta get crafting. Hope you've seen some paper that inspires you.....all available at Ben Franklin Crafts right now! 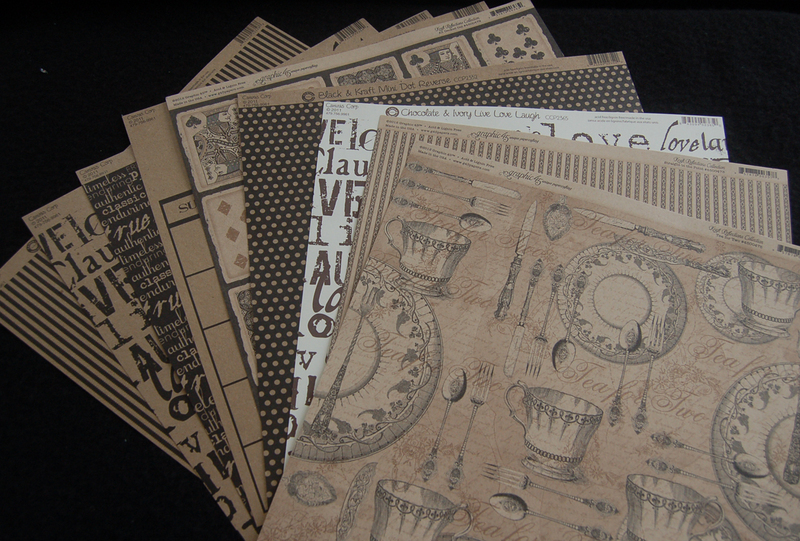 Please visit this blog again to see some of my creations using these papers.